The other day, Karl asked me what I wanted for my birthday. I gave myself a minute to think about it, then came up with the following items: straps for my yoga mat, a microfiber towel (also for my yoga mat), and a dark wooden pallet (not for yoga, but for food photography). After I finished listing my makeshift wish list, he gave me the funniest look. Up until that moment, I don’t think he realized that his girlfriend is all about practical gifts. Afterwards, I talked his ear off about my new obsession with yoga at Corepower. Hence, the succinct list of yoga related birthday gifts. Yoga has helped me be a better food photographer – I do lots of forward bends and halfway lifts to get overview shots, and thanks to yoga, I can now hold myself up for long periods of time! Speaking of my birthday and aging…First, let me preface by saying I’m Chinese, and I’m well aware folks have a hard time getting my age right. In general, it’s an underestimation. One evening, while Karl and I were having dinner at Thanh Long in San Francisco, I noticed in my periphery one of the ladies at the table over was blatantly staring at me. I tried my best to ignore her piercing glare, but she got my attention and said “Excuse me, could you please tell me how old you are? I’m asking because you look about 13”. I was flabbergasted and turned bright red in the face. Karl chimed in and jokingly said, “Don’t worry, she’s actually 14”. She responded, “Then I hope you’re 17!” Karl and I laughed about it the rest of the night. Strangers have also wildly overestimated my age, but it’s usually by about 5 years at most. A few months before the restaurant incident, I asked my little sister to accompany me to a doctor’s appointment. I walked up to the receptionist with my sister next to me and told her I was here to check in. The receptionist then asked, “Are you checking in for you or for your daughter?”. My eyes widened to the size of lemons, and I reflexively defended myself, “She’s not my daughter, she’s my sister!” This wouldn’t have been such a blow if my little sister was 2 years old, but she wasn’t. That’s when I knew I needed to start using eye cream. Cliche teenagers in movies I watched growing up tried so hard not to be the nerd of the class. In high school, I tried really hard to be one. I’m still trying! To be called a nerd is a compliment in my book. 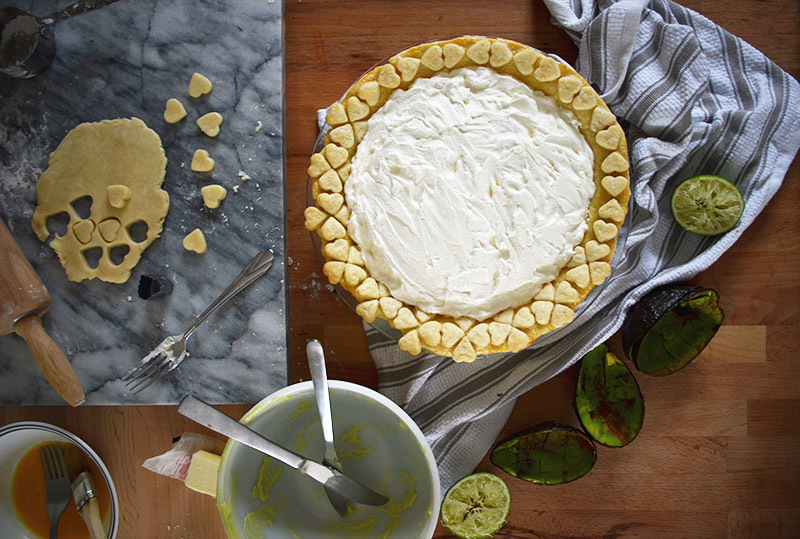 Today is pi day, a day that math teachers and food bloggers love to celebrate. 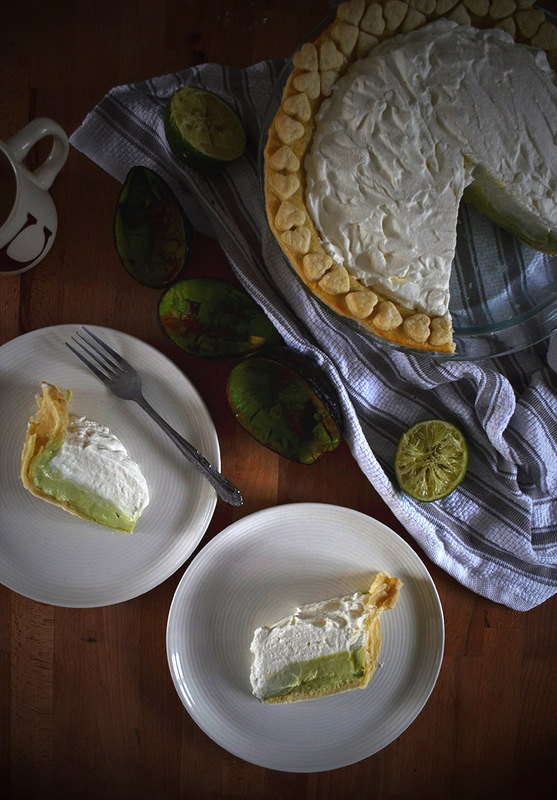 In honor of the mathematical constant whose value at two decimal places is coincidentally also a date in March, I am sharing my recipe for avocado pie, adapted from Food Network Kitchen. Also, St. Patrick’s day is coming up, so there’s that. I struggled with the name of this pie, as I wanted to completely nerd it out and call it Avogadro’s pi(e). I refrained for fear of getting booed at by Karl. When I pitched the idea of this pie to him, his response was, “you mean guacamole pie with tortilla crust?”. No – but thanks for giving me an awesome idea for a future post! Some of you may be on Karl’s side and think I have fallen off the wagon with this pie, but wait – let me explain! Avocados in Asia are frequently used in desserts. One of my favorite ways to enjoy avocados is in a smoothie. The perfect avocado smoothie, often served in boba shops, is rich, smooth, and sweet. It’s made with sweetened condensed milk and served with whipped cream. I thought to myself, “how could this not be good as a pie?”. The filling is a beautiful, all-natural green color, and not to mention, incredibly delicious. 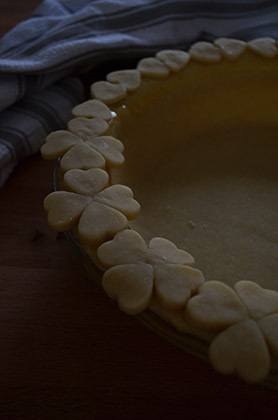 And as if the green was not enough, I lined half the rim of the pie with little four-leaf clovers to salute St. Patrick’s Day, a day I know nothing about other than the dress code. I topped this darling pie with fresh whipped cream and enjoyed a slice by the window while watching the rain come down. Pi day has never been so tasty. Ps. For those of you who follow my little blog, you’ll notice that I finally took a leap of faith and experimented with dark photography. It was so much fun playing around with the settings of my Nikon and scouring the internet for help. Thank you to the extremely talented Peter at Souvlaki For The Soul, Betty at Le Jus d’Orange, and Cynthia at Two Red Bowls for being my muse and unbeknownst to them, my teacher. I am so looking forward to learning more about this style of photography! Pps. Yes – I like my whipped cream with a side of pie. In a food processor, combine the flour, salt, and 1 teaspoon sugar. Turn the food processor on for 3-5 seconds to mix. Add the butter, and pulse 4-5 times, until the butter is about the size of peas. Transfer to a large mixing bowl. Slowly add the water, and gently incorporate it in with your hands, until the dough forms a ball. Shape the dough into a disc about 1-inch thick, wrap tightly in plastic wrap, then chill in the refrigerator for 1 hour. Take ⅔ of the dough, and roll it out on a floured surface until it's a flat circle (depending on the height of your pie dish, about 12-13 inches in diameter). Place the dough into a 9½ inch pie dish and leave 1 inch on the rim, but do not stretch the dough (this will cause it to shrink in the oven). Roll out the remaining dough until it's flat, but not too thin that it'd tear easily. 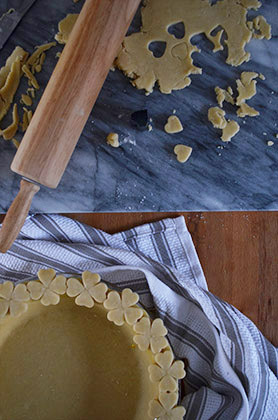 Use a small heart cutter to cut out hearts in the dough. Beat one egg in a small bowl, then brush it around the rim of the pie (the egg wash will act as a glue for the hearts). Place 4 hearts into a cluster on the rim so that it looks like a four-leaf clover. Continue around the rim with the remaining hearts. Preheat the oven to 400 F degrees. With a fork, pierce the bottom of the crust 15-20 times. Line the crust with foil, but leave the rim exposed. Fill it with dried beans (these will act as weights). Bake at 400 F degrees for 12 minutes. Take the pie out of the oven, and remove the beans. Reduce the oven temperature to 350 F degrees, and bake uncovered for 10 minutes. Let it cool on a wired rack. 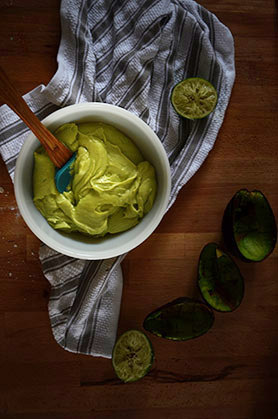 In a food processor or blender, or with an electric mixer, blend the avocados, cream cheese, sweetened condensed milk, and lime juice. 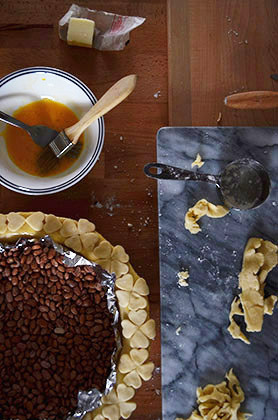 Pour the filling into the cooled pie crust, and level with a butter knife or an offset spatula. Place plastic wrap directly on top of the filling to prevent a skin from forming, and refrigerate for 2-4 hours. In a large mixing bowl, beat the heavy cream on medium speed. When it begins to thicken, slowly add 2 tablespoons sugar. Continue to whip the cream, until peaks form. Be careful not to over whip. Spread or pipe over the chilled pie, then serve or refrigerate. If the dough becomes too soft and sticky, especially when you're cutting out the hearts, leave the dough in the refrigerator for 15 minutes to firm up. 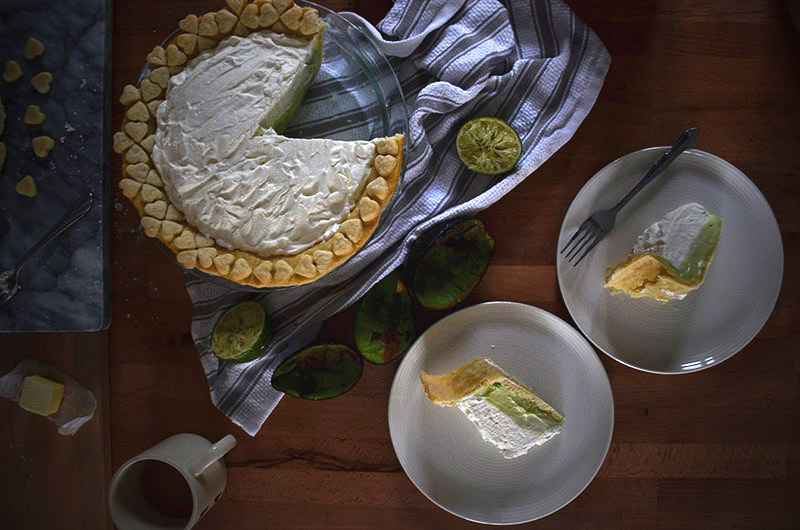 This entry was posted in Desserts & Sweets and tagged avocado, condensed milk, cream cheese, pie, whipped cream. This pie looks delicious! I totally understand what you mean by using avocado in dessert – the avocado smoothie (and the avocado slushie!) is one of my favorite flavors at boba shops. With the fluffy cream on top, this pie is ready for pi day and St. Patrick’s day. LOL to what the lady at the restaurant said about your age! It’s wonderful wonderful that you look young! I don’t think anyone has ever said I look 13, but in 10 years I will WISH people said I looked 23! plus practical gifts are the best ones! I also like getting practical gifts over pretty things. Kitchen aid stand mixer >>>> jewelry! Also I like your dark photography photos! They look very beautiful and mysterious. I’m liking this experiment! Next time I’m in California, we’ll have to go on a date and get boba. It has been too long since my last avocado smoothie and my last date with Dr. Savoring Spoon! Haha I love that we’re on the same page about gifts. Diamonds are pretty and all…but can it knead dough?!? It was really fun learning more about dark photography AND my camera. I had never adjusted the camera settings until then :p I always shot in auto mode! Looking forward to a boba date next time you’re in California! Glad you’re enjoying the dark photography! 🙂 it looks great! Thank you, Kristin! This pie is so delicious – def a crowd pleaser (: Condensed milk makes everything better!! Let me know what you think if you get around to trying it!! 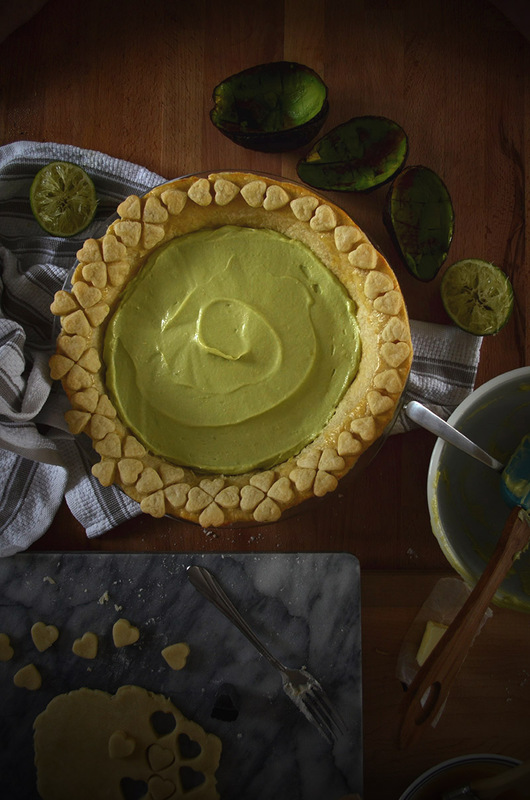 Oh my gosh, avocado pie sounds so delicious!! I looove avocado smoothies and ice cream so I just bet this is amazing. Plus the four leaf clover pattern is so cute! And yay for experimenting with dark photography!! I love it! 🙂 Thank you so much for the kind words! Thank you, Cynthia (: I owe this photography experiment to you!! Aw Connie thank you for the mention! Blushing over here. This pie looks so yummy! 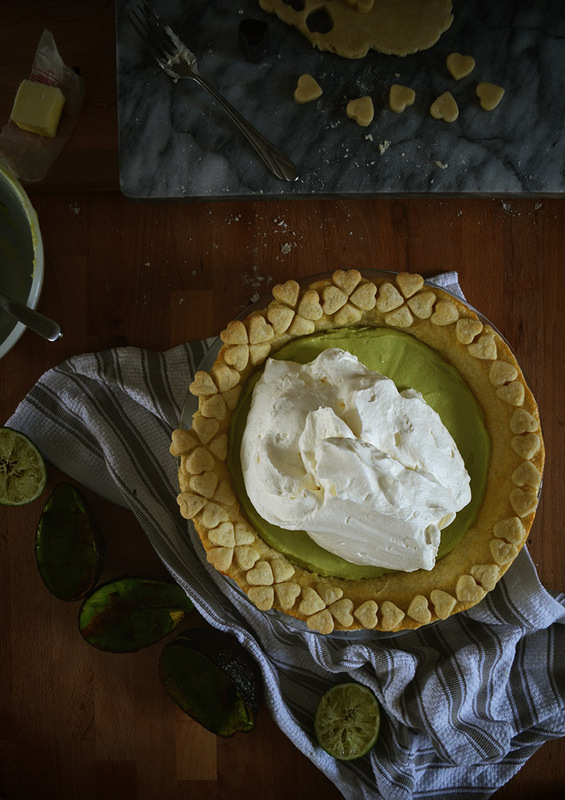 I love avocado in anything and everything, and I bet this pie turned out really well. Plus whipped cream?? Dream pie right here. Thank you for all the inspiration!! I am probably one of your biggest fans :p Also, I’m with ya – avocado in everything and anything = happy stomach!! The pie looks absolutely delicious Connie! Loved the new style of photography! Keep it up! Thank you so much for the kinds words and support, Manali!! You are so sweet! !